For the past few days, I’ve been battling severe windy conditions here in Iceland. By severe I’m talking gale force to hurricane force winds. If there is anything that a photographer hates most it is wind. The skies can be blue, the clouds picturesque, the scene illuminated with golden light. But if the wind is blowing, it’s hard to stay steady enough to capture a good image. How, then, do the pros do it. The following image was taken, believe it or not, on a freezing cold beach on Iceland’s south coast, with the winds blowing at hurricane force (that’s 70+ miles per hour)! Click on the image to enlarge it. My colleague and I sat in our vehicle for ten minutes, looking over the spectacular black sand beach, the icebergs in the water being buffeted by giant waves, and nature’s fury lashing at the waves head on. Should we chance it or not. We discussed the pros and cons and for a second or two I had the 4-wheel in reverse, ready to leave. But the failing light of day convinced us to at least give it a try. Bundled up, we trudged the 150 yards to the shoreline, the wind lashing our backs with grains of sand. Our most immediate concern was with our gear, which we protected as best we could, helped by the fact that the wind was on our backs and not sand-blasting our lenses. The secret is to stay low, tripod legs extended to provide a stable base. In winds I typically hang my backpack from the hook on the underside of my tripod to add mass and stability. In this case I wanted to use a low ISO to show movement in the water and to highlight the dark sands. For you photography nuts out there, my equipment included a Hasselblad H4D-50, 50-110mm lens set at 95mm, an aperture of f18 and a shutter speed of 1⁄2 second, using a cable release. I also had a polarizing filter on the front of the lens both to decrease shutter speed so I’d get movement but also, truth be told, to protect my lens just in case. This is only one of a series of images I took. It is not processed at all (I am still on the road in Iceland). I just wanted to illustrate a point about photographing in wind. This next image I took on a stop the very next day, with the winds still at gale force. This small waterfall beckoned from the road as I passed and so I put on my wool hat, wind parka and hood and gloves and set up next to the falls. Again, I stayed low, spread out my tripod legs, hung my pack from the center hook and shot away. I also took a panorama of this falls, which I hope to share with you in the next month or so in a blog I’ll do on panorama shooting. 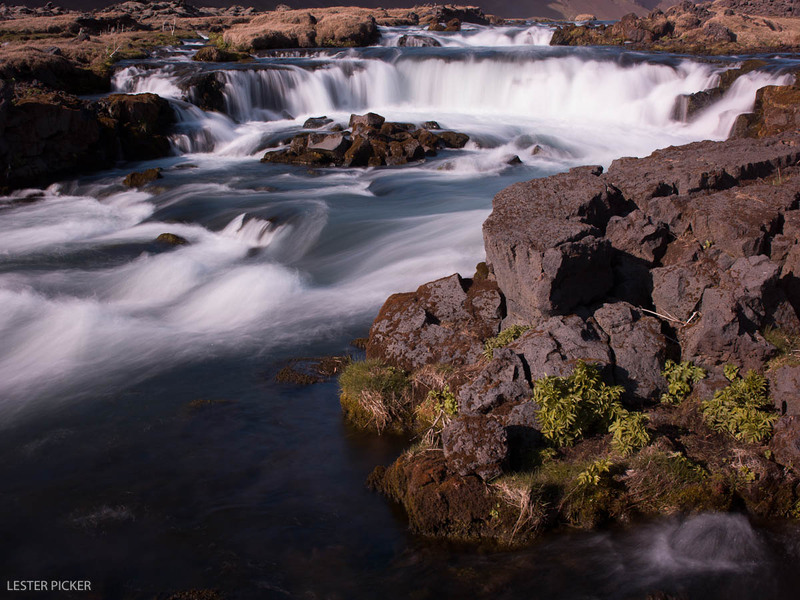 The equipment was the same as above, but I shot it at ISO 50, f11, 1⁄3 second to show water flow. Normally, in winds you want to shoot at as fast a shutter speed as possible in order to minimize shake and blurring. But I was faced with the conundrum of wanting to shoot slow to soften the water. My point here is that even this can be done if you pay attention to basics; a sturdy tripod with cable release, good technique and, most importantly, perseverance.